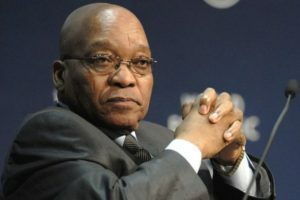 Former South African President Jacob Zuma has asked prosecutors to drop charges in his corruption case relating to a 1997 $2.2 billion arms deal. Zuma who resigned in February following pressure from the ruling African National Congress (ANC), faces 16 counts of fraud, racketeering and money laundering over a R30 billion procurement of military equipment for South Africa’s armed forces. He however denies any wrongdoing. According to Reuters, KwaZulu-Natal High Court Judge Mjabuliseni Madondo on Friday adjourned the case to May 2019, giving both defence and prosecution more time to prepare their arguments on whether there should be a permanent stay of prosecution on the charges. Zuma’s lawyer Mike Hellens said State prosecutors had displayed a dismissive attitude towards the ex-president, who was reportedly in the court for the fourth time since the hearing started earlier this year. Media reports say Zuma’s charges were initially filed against him about a decade ago but were then postponed by the country’s State prosecuting agency shortly before he successfully ran for president in 2009.